Ashley Monroe and Rodney Crowell. Photo Eric Adkins. Music Health Alliance held its Third Annual Celebrity Barn Dance Saturday night (Oct. 29) and host Rodney Crowell had a health scare just as the event kicked off that demonstrated why the organization can be so important. Crowell had wrapped sound check when he had a cardiac situation that sent him straight to the emergency room. As the night drew to a close, he returned following his release from the hospital to surprise the crowd with the final two songs of the evening. 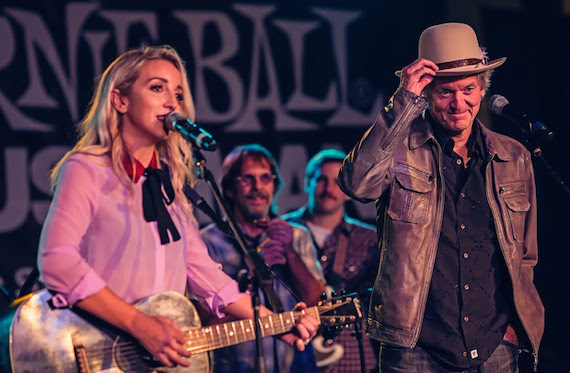 Vince Gill, Ashley Monroe, Emmylou Harris, and others entertained the crowd at the Jaeckle Center, a premiere equine facility and the largest barn in the South, and helped raise more than $50,000 for Music Health Alliance in the process. The Nashville-based nonprofit provides patient-driven healthcare advocacy and support and has secured over $12 million dollars in healthcare resources in just three years, enabling access to doctors, medicine, health insurance and financial assistance for 4,600 music industry entrepreneurs and professionals.